As usual while surfing beautiful places in Indonesia on Mr.Google. Got what a wonderful place, its name Tangsi Beach or also known as Pink Beach. It is one of Indonesia charming that truly unfortunate if you miss it when you have opportunity to visit East Lombok. Actually, Tangsi’s sand color is white as common another beach, but the special things of pink sand is because it mixed with fragments of coral reefs fine reddish color. its pink sand clearly visible when the weather clear and the sand exposed by seawater. Unusual colors that make Tangsi beach really unique and interesting place to visit. On the other hand, the uniqueness of Tangsi’s sand beach, it brings other natural beauty such as the cliffs that can be used by visitors to watch the pounding waves closer, calmness of the sea with the relatively small wave. its also attract tourists who love the beauty of beneath sea, visitors can snorkel to watch coral reefs and marine life which is captivating. Location, it located in the village Tangsi Sekaroh, District Jerowaru, Lombok Timut. This beach is one of the few pink beaches in the world. In Indonesia, another pink beach sand color can be found on Komodo Island in East Nusa Tenggara. Accessed Location, From Mataram, Tangsi Beach located take about 2 hour drive. The condition of the road to the beach, according to several bloggers who had been to the Pink Beach is still fairly poor condition. Stretch of rocky gravel extremely difficult journey to the beach area. But the panorama while access will make visitors forget the poor of road conditions. We recommend that visitors use private vehicles because there is no public transportation served. Lodge, none in coastal areas, the adequate lodge can be found in around Mataram..
Culinary, you'd better prepare yourself mainly drinks from home or buy at the nearest district, because there rarely sell along the way to the beach. Similarly in beache areas are also difficult to find who sell food or beverages. Who intending to Tangsi Beach, give my regards to the creation of God on this one. God has created it so beautiful, our task are to keep it beautiful. Allah has bestowed a beautiful nature, our task to keep it together. 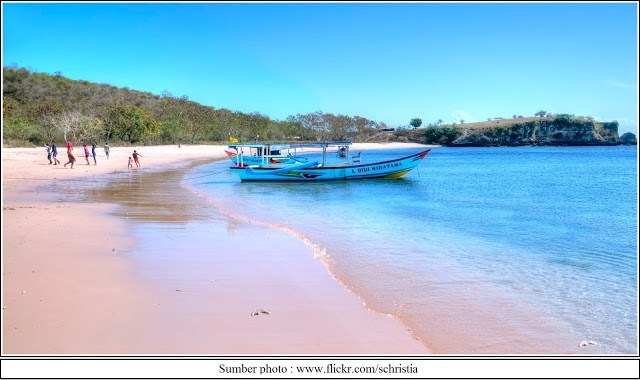 0 Response to "Tangsi Pink Beach on East Lombok"